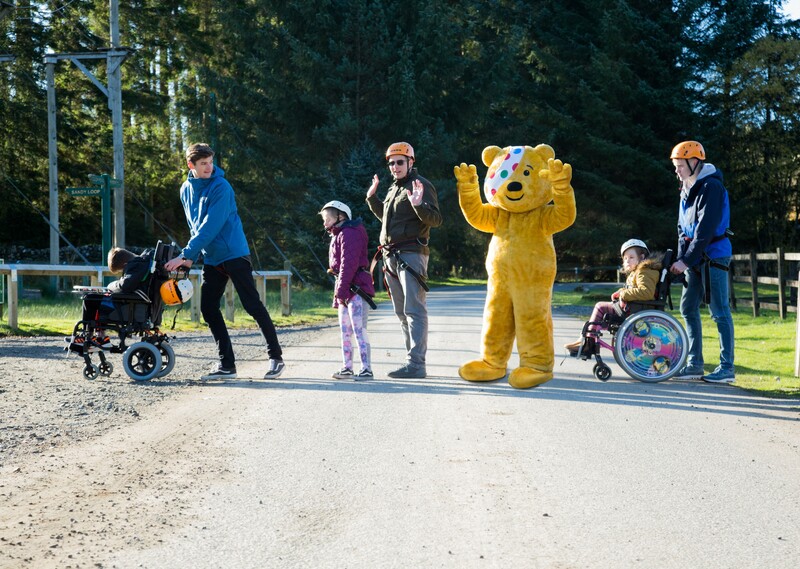 Pudsey Bear enjoyed an exhilarating adventure holiday recently with a group of disabled children and young people from across Scotland as part of this year’s Children in Need. The beloved bear joined the trip to Kielder Water Outdoor Centre in Hexham, Northumberland, run by Aberlour Children’s Charity’s Options Adventures Service. He spent the day trying out adrenaline pumping activities with the young people including rock climbing, abseiling and a 20-foot-high King Swing. Aberlour’s Options Adventures service helps children and young people with disabilities enjoy adventure holidays through a specialist short break service. The adventure is tailored to the needs of the children, with the aim of helping them learn new skills and make friends, whilst also increasing their confidence and sense of independence. This year Aberlour received a grant of almost £10,000 from BBC Children in Need to help fund the Options Adventures service, which is expected to support more than 160 children and young people and around 240 carers between April 2018 and April 2019. Activities so far this year have included kayaking, rock climbing, abseiling, paddle boarding, and horse riding. Meanwhile, in early December, a group of around 20 children and young people will attend the Options Adventures annual Santa Cruise along Edinburgh’s Union Canal. Janet Parker, Co-ordinator for Aberlour’s Options Adventures Service, said: “We know that young people with disabilities often miss out on the same outward-bound trips as other young people. They need support, which some providers are not able to offer. Our specialist short breaks service was set up to combat that. However, it’s also way more than an adventure trip service. We try to offer life enriching experiences for young people with varying levels of disabilities, and memories that will last a lifetime.